We are often asked by new members, prospective new members and even by other genealogy societies about events and subject matter that we provide at our regular monthly meetings. Below is a list of activities for 2018. On Wednesday November 28, 2018, in addition to our regular monthly meeting, The VGS held an afternoon workshop. Our guest speaker for the day was Margo Fariss Brewer. The morning presentation was "Newspapers & Times: Mastering This Combination Can Expose Unanticipated Records." We learned that mastering the genealogical research tools of timelines and newspaper research and then analyzing their results together will point you toward possible new resources and records for your ancestors. In the afternoon workshop, we learned techniques for "Writing a Family Narrative Your Family Will Want To Read." Handouts for both presentations can be found under the"Members Only" > Webinar & Meetings menu options. Video will be available soon. On Wednesday September 19, 2018, The VGS using our own GotoWebinar platform, presented our first live general monthly meeting to our membership. We had approximately 135 members present at the meeting and another 55 in attendance online. Several additional members have already viewed the meeting after it was posted to our website. In addition to the membership meeting, the presentation "Creating Google Map Tours" was presented by Karin A. Fortin. Members can view the entire meeting by logging into the "Members Only" section of our website. Select the "Webinar & Meetings" menu option. 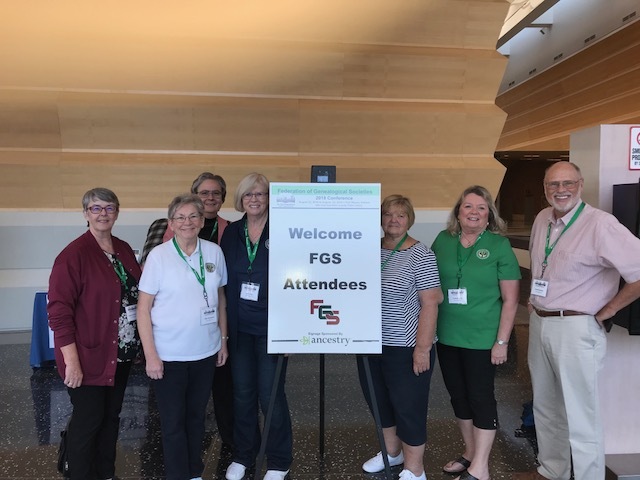 While our President & Vice-President and several of our other members were away at the FGS Conference in Ft. Wayne, Indiana, our regular monthly meeting featured a different twist from our usual meetings. We had round table discussion groups where we "Talked Genealogy." The feed back as people exited was wonderful with everyone hoping we will repeat this format soon. One attendee told us that she loved having people with varied expertise at the table. She said she learned answers to questions she didn't know she should be asking! 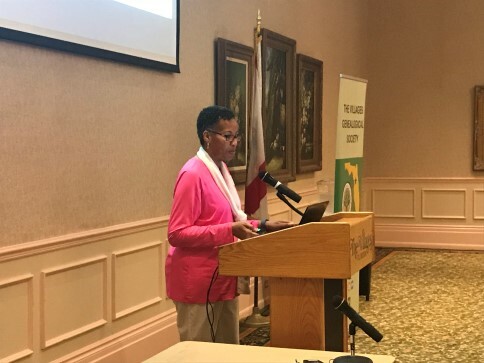 The July General Meeting featured our very own VP Annette Burke Lyttle as she presented "How Research Plans Can Up Your Genealogical Game." Annette explained that taking some time to plan our research will actually save us time once we get into the records and allow us to target the records and collections that are most likely to get us the results we want. Why do you need a plan? The vast amount of records now available online can result in missing useful records or attaching records to our tree that don't really belong to us. Members can download a copy of the handout by logging in under "Members Only." 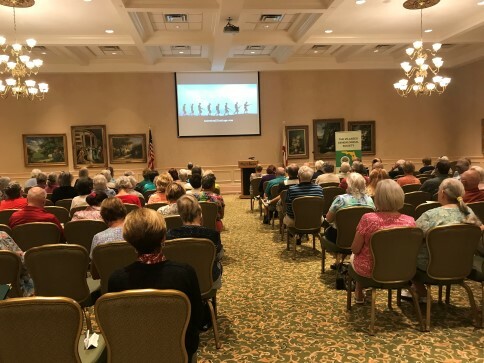 The June General Meeting was a live webinar and we have about 80 members present at the Savannah Center and another 80 members watching online as Katherine R. Willson presented "Filling Out Your Family Tree Without Breaking the Bank." The general consensus following the meeting was "Wow, I didn't know there were so many free research websites." Members can download a copy of the handout and/or watch the presentation by logging in under "Members Only." The May General Meeting was well attended with about 160 members present. Our guest speaker was Donna Moughty from Lakeland Ranch, Florida. Donna has spoken to our group on several occassions. Her topic was "Finding the Women In Your Family Tree." Donna pointed out that prior to the 20th century, many women didn't have an identity of their own. They were tangled with the father of husband often making research difficult. Following the meeting, she had a large crowd asking additional questions. The April General Meeting was very well attended with over 200 members present. Our meeting consisted of four member presentations by President Pat Adams, VP Annette Burke Lyttle, New to Genealogy SIG Coordinator Carol LaSalle and Webmaster John DeAngelo. Each member was allotted 10 minutes to make their presentation and 5 minutes for Q&A. A copy of the slides is in the "Members Only" section of this website. 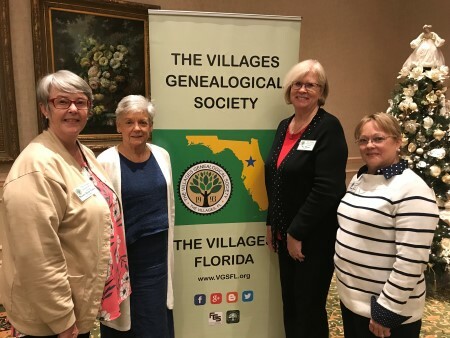 The topics were about using, Newspapers, Books, the FamilySearch Card Catalog and the "Resources" on the VGS website to expand your research capabilities. From our survey results, Dr. John Colletta was well received at our 18th annual seminar. A big "Thank You" to all the volunteers who helped make the day a success. All 4 Handouts are now available in the "Members Only" section for 30 days only. January is usually a full house and our best attended meeting of the year and 2018 proved to be no exception. 402 members were in attendance to hear Maureen Taylor, The Photo Detective, present "Identifying and Dating Family Photos." From comments overheard after the meeting is was a very well received presentation. She identified major characteristics of photographic methods, types of images, how to start at home and network with relatives, clothing clues, and using any photographer's imprints to help identify the photographic. In her afternoon workshop, 100 additional members were on hand for her presentation "Discovering Genealogical Clues in Photographs." Her first question was is a photograph a Genealogical Document? Yes it is! Handouts are available in the "Members Only" section for 60 days.